1. Lately, I’ve been hooked on Garden & Gun, so I finally subscribed. The magazine celebrates the best of life and style in the south. The pictures alone will captivate you. Just so ya know, the mag is available at a discounted price through Magazines.com, but I’ll do you one better. Visit that site through Ebates and you’ll get 26% cash back after your purchase. Pretty sweet deal. 2. I got the Madewell Transport Tote for my birthday and I’m already in love. I’ve wanted it for the longest time, but I just recently purchased a new handbag, so I was trying to hold off. Just couldn’t. The leather is buttery and rich, and is only going to get better with age. Will be perfect for farmer’s market trips, casual days shopping around, and as a tote for trips. I got it personalized with my initials in gold. That’s the icing on the cake. 3. I’ve been loving these Krystyn Sandals. I don’t have dressy sandals like these, so I’m fully going to take advantage of wearing these on days I need to look pulled together for work meetings, but don’t want to wear heels. Get 40% off your purchase today, 8/19 only, with code SURPRISE. 4. Also truly impressed with the Adelia T-Strap Pumps. The heel is the perfect height to make your legs look super long, but not too high where you’re uncomfortable walking in them. They’re ultra chic and versatile enough to be worn with casual or fancy looks. 5. This Dior ‘Diorskin Forever’ foundation is my all time favorite. I’ve loved it longer than I’ve loved any other formulation and really feel like I’m able to stop my wild search for my holy grail foundation. It has SPF 25, so that’s always a plus, but it still tends to photograph pretty well in flash photography. It’s lightweight, but has technology that makes it fuse to your skin, so it lasts a long time (hence why they call it “forever”). I have been wearing this all summer and apply it with a flat top kabuki brush that has been dampened with water. This makes the foundation go on even more naturally. I do not wear tinted moisturizers in the summer because they literally fall off my face in the heat. That’s a winter item for me, when my skin is dehydrated. In the summer, I am all for these long lasting foundations, just applied minimally. 6. Another birthday gift I received is this Citizen Eco Drive Leather Strap Watch. I love the rose gold-tone dial and how sophisticated, understated, and feminine it is. In general terms of style, I’m really leaning towards natural textures, neutral colors, and simple pieces. This fits the bill. 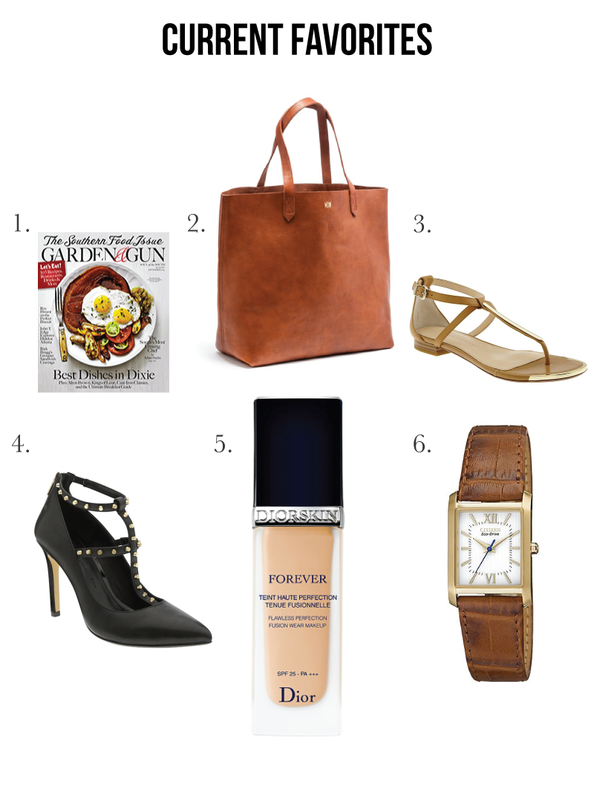 Love the Madewell tote and those heels – adding them to my fall wish list right now! I fell in love with the Dior forever foundation too until I started breaking out – darn sensitive skin!! I love the T-Strap shoes! I saw today Banana Republic is having a surprise sale for 40% with code SURPRISE. Making these shoes at a great price! I love, love, love the Madewell Tote. I have to checkout the magazine. Haven't tried the forever foundation, but I love the airflash foundation by Dior. I ordered the Adelia T-strap last week and can't wait for them to arrive! Unfortunately these shoes were excluded from the 40% discount. I have been wanting that Madewell bag too, it is gorgeous and glad to hear it is just as good in person!! I love Garden and Gun big time!! The sandals are gorgeous and yes! I use that foundation, its amazing and it lasts so long!